Due to the risk of inclement weather, please be advised this event will be rescheduled for a date in October. We will update this event page once that has been confirmed. 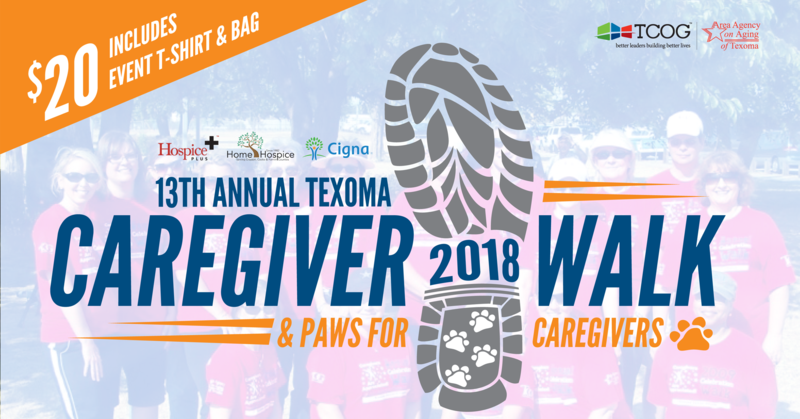 Join TCOG and the Area Agency on Aging of Texoma for our 13th Annual Texoma Caregiver Walk on Saturday, September 8 Saturday, September 22 at Fairview Park in Sherman. $20 participant fee includes event t-shirt and bag. ==== Also! PET PARADE & COSTUME CONTEST presented by Home Hospice This Pet Parade & Costume Contest is free to enter and has 5 categories with prizes. 100% of all donations remain in the Caregiver program serving all Texoma caregivers, including those who care for loved ones with Alzheimer’s and Parkinson’s diseases.